There was a circle of mushrooms in the forest. Smoke could be seen from the ground between them. Flames emerged as a hole opened. A hand came up between the flames, grabbing the edge. Another. Two horns, an evil face. A foot. The little demon pulled himself out of the hole, got on his feet. Stretched his back and looked up on the starless sky. The night was coming to an end. Soon ridiculously disgusting human beings would start doing their insignificant things, thinking they mattered. Repulsive. He wanted to do something different today. He usually spent his days corrupting the minds of the rich and the powerful, but it was getting boring. Too easy. He wanted a challenge. He sat on the hill watching the ugly sunrise over the houses further down. He saw people getting into their cars, going off to their stupid jobs. He waited some more, and went down into the village. He heard a sound. An uncomfortable giggling sound. A little boy was playing with his friend, a girl the same age. The little devil looked at them for a while, then he moved closer. -This is for you, the little boy said. He held out a bouquet of flowers. -Oh, thank you! The little girl lit up in a big smile. 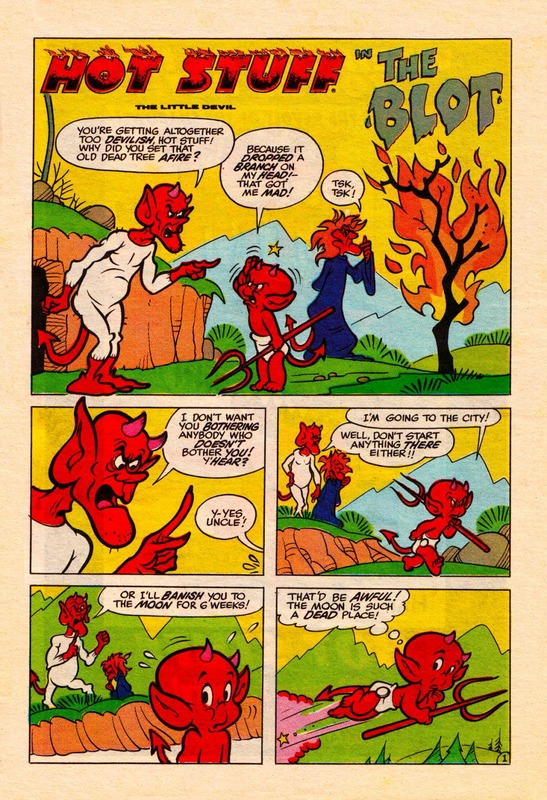 The little devil frowned with disgust. -Over there is a great place to play, he said. -At the edge of the bluff? But we’re not allowed to go there…? The little girl looked at the forbidden part of the garden. -That’s because our mommies don’t want us to have fun! Come, let’s go! It’s probably great there! He started walking closer. The little girl followed, a bit doubtful. She did like to have fun. It was a log way down. The little girl waited some meters away from the edge as the little boy was looking down. -I don’t wanna! She was afraid of heights, but didn’t want to admit it. The boy looked at the girl. His best friend, and a bit of a crush, too. He felt an urge inside, a strange, dark drive of evil, pulling him towards her. Somewhere inside, his heart was screaming no. A voice was coming from the love of his friend, a warm emotion, a feeling of belonging. No. -No! He said out loud. -No what? The little girl looked puzzled. -Let’s go play somewhere else, he said. -I don’t like it here. As they ran back over the grass, the little devil’s stomach was revoking with loath. Vomiting he snuck off towards the parliament. He needed to restore his faith. Parliament? Little devil’s going to be way out of his league there. Or it will be easy pickings… Most of the job is already done. Phew! I’m glad the little boy refused to push his best friend off the cliff. He pushed too hard. The little demon, I mean. He’s had it too easy, on marks who were already on the road to corruption and so he got lazy. Have you read The Screwtape Letters, by C.S. Lewis? Letters of advice from an Uncle Screwtape, retired demon in Hell, to his nephew out in the world tempting souls. Worth the read, imho. He almost made it… I haven’t read it, or anything else of C.S. Lewis as I can recall. I probably should. Thanks, I’ll check it out. He’s gone to parliament! Hahaha, now I feel sorry for him; most days parliament makes me want to jump off a cliff.